We finally did it, after years of considering, and months of waiting for the right vehicle to come along, we have bought our first electric car – or van in this case. A slightly unusual vehicle, especially here in NZ. I can’t be sure how many MiniCab Mievs there are in NZ, but having watched the Trademe and AutoTrader ads for a few years, I can’t imagine there being more than 6 or so. Locally, there is a white 10.5kWh version, which we test drove many months ago. There are at least a couple in the Dunedin area, one of which has been in the dealer showroom for many months too. This one is unusual in that it is painted Red, as MiniCab Mievs are only available in White and Silver from the factory. Originally white, it was painted red and some modifications were made to it for the Japan Postal Service, who then cancelled the order. 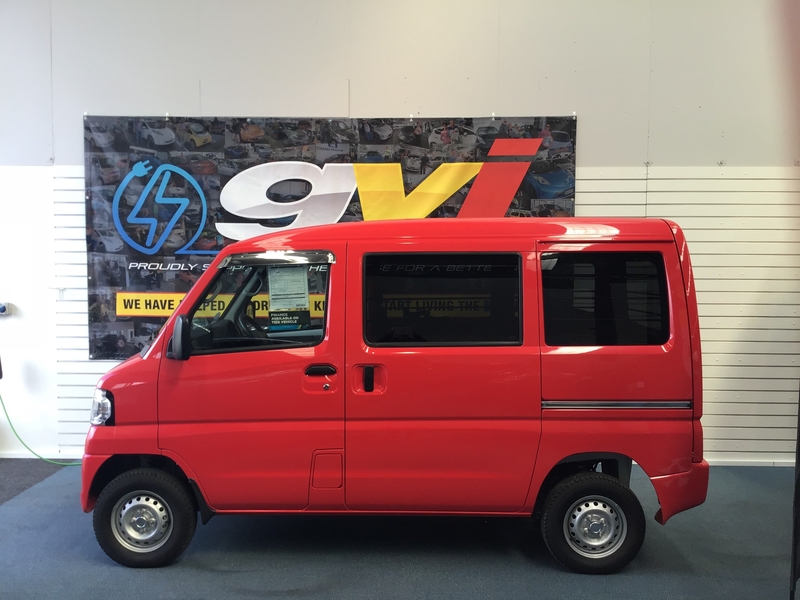 There are a few other examples in Sri Lanka and Australia, but only two in NZ that GVI imported (that I know of). It is a 2017 model, and came with 25km on the clock, which was up to 55km by the time we took delivery (most of which was our test drive). The modifications to the vehicle (besides the colour) are (or were) 3 bars over each of the 4 side windows and the rear window, a cargo barrier behind the front seats, the cigarette lighter has been removed, and the ashtray has a blanking plate over it (obviously a smoke free workplace policy in Japan Post). Since we took ownership, I have removed the cargo barrier, which allows the drivers seat to go back another 3 centimetres, and allows the seat back to recline further, making the seating position very drive-able for a 1.83m slightly overweight person like myself. I also replaced the missing cigarette lighter with a dual USB port socket which fits into the same position (after enlarging the hole a little). It came with an OEM Audio 8 Amp EVSE with a standard 3 pin NZ plug on it for slow charging overnight, and the car came with two sockets, a type 1 slow charging AC socket, and a ChaDeMo high voltage DC socket on the other side of the vehicle. It is 3.4 metres long, maybe 1.5m wide, and about 1.9m high! The load bed inside is a minimum of 1.2m wide, but is up to 1.35m wide in places, and is 1.9 metres long with the seats pushed forward – room enough for a mattress or two e-bikes. This is the two seater version, so has a flat floor instead of a seat and a foot well, and there is some room under the false floor at the front of the load bed, room for charging cables, tyre changing tools, emergency triangles etc. Since picking it up we have done about 400km, have charged it at home about 4 times, and charged it at the Dowse Museum in Lower Hutt on the 25kW charger – as the cables on the 50kW won’t reach the charge port! It took 22 minutes to charge from 46% to 83% charge and cost $4.41. I have tried our local charger in Porirua (Serlby Place) and if I park on the right hand side, between the yellow post and whatever other street furniture there is, with the front wheels a few centimetres onto the curb, the 50kW charger cable will just reach the ChaDeMo port. Note to Chargenet – great service, great facilities, but as you replace chargers, can you put cables like the ones on the 25kW units on the rest of the chargers? I have an OBD II dongle on order. This too has to be a bit special, as the software I will be using (CanIon) which allows me to monitor all aspects of the cars performance, including cell voltages and temperatures, needs quite a sophisticated OBD tool which can cope with large amounts of information all at once. When it arrives I can look at the battery state and report back. I will also be able to monitor electricity consumption and keep track of trips more easily. As a daily driver, it is remarkably good. It is a tiny van, and in its petrol form it must be horrible, with a 600cc noisy engine and manual gearbox. But in its electric form, it performs like a normal car, accelerating away from lights and junctions faster than normal traffic, and with a top speed of 120kph. However, being electric and with a very prominent economy meter and range meter, one tends to drive a little more sedately. Plenty of room for driver and passenger, a bit basic in the equipment area, with manual windows, dial controlled heater and ventilation, and a radio with a built in speaker in the dash. On the good side, it has heated seats and air con if you have a short journey to your next charge point! This morning I turned the heater up until it was just between the blue and red areas, and the range went from 100km down to 78km instantly! Electric power steering, servo brakes and fly by wire throttle make for a very relaxing drive, and the upright driving position is really good at my age! Adjustable headlights for when I put 35okg of junk in the back add a touch of sophistication. Three “gear” positions, namely D for normal power and regeneration, Eco for more economical use of power (a bit limiting on hills) and B with a more aggressive regeneration setting, and normal power usage. I like this last setting, but it can be a bit too aggressive on most downhills, slowing the car down too much, where as the normal regen is not quite enough sometimes. Noise is unsurprising – quieter than a normal van with very little motor noise, but quite a lot of road noise from the little wheels through un-insulated wheel arches front and rear, and odd noises from cooling pumps (for the controller and charger) and possibly servo vacuum pumps. All those Japanese chimes and beeps are of course very loud in the quiet car, I worry about waking the neighbours with the reversing alarm when I leave the garage at 6:00 a.m.
Running costs – currently it looks like about $2.40 per charge at home, from which we can commute 3 times to work and back, or have a good day of pottering about seeing customers and taking Lynn for a coffee. Next job is to sign write the van with some business details, and maybe some flash decals with an EV theme. and if there is anything you particularly need to know, just ask.